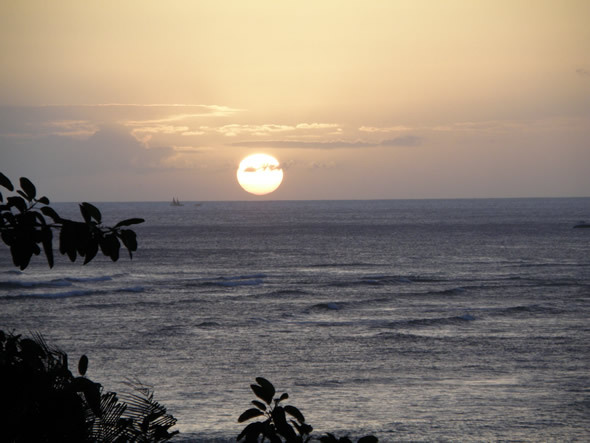 As the day draws to a close, so does another year at the Dereila Nature Inn. New Year for more fun with nature and photography. 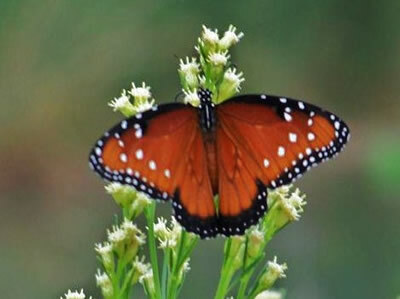 Hello everyone and welcome to the year-end issue of Whispers, the newsletter of the Dereila Nature Inn - your virtual nature centre. We send a special welcome to our new subscribers this month and our heart-felt thanks to those of you that have been joining us each month throughout the year. We really appreciate your support, ideas, contributions and enouragement. 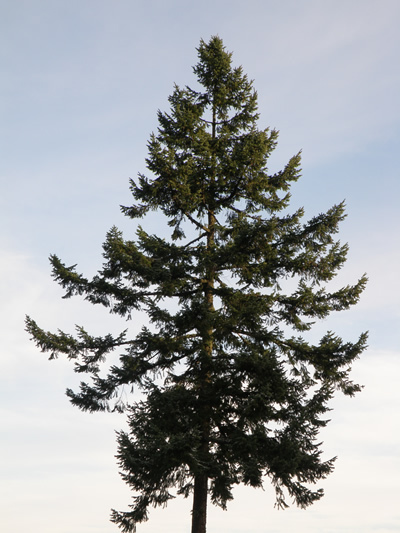 Which is the tallest non-redwood tree? Our newest interactive crossword focusses on red, pink and orange flowers. There are several new additions to this section of photographs and facts. We invite you to submit nature photographs to this section. As always, we have some more wonderful submissons from our subscribers this month. Nancyj Hovey, New Port Richey, FL. 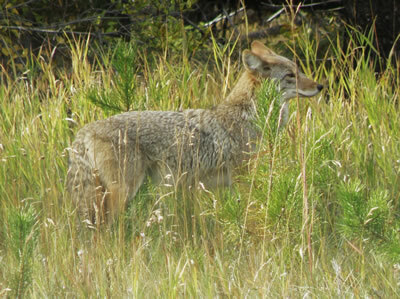 Michele J. Durnil, Chino Valley, AZ. We are always thrilled to receive your wonderful photographs. Many thanks to Marilyn, Nancyj, Donna and Michele for your contributions. Bug - Bald-faced Hornet; Wildflower - Piggyback Plant; Bird - California Quail. through the grasses in the Canadian Rockies this past autumn. 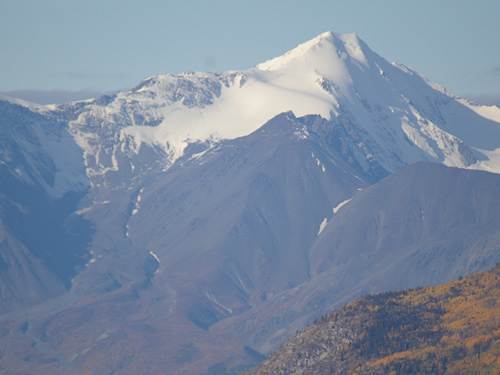 and soaring peaks including Canada's highest mountain. that was declared a UNESCO World Heritage Site. 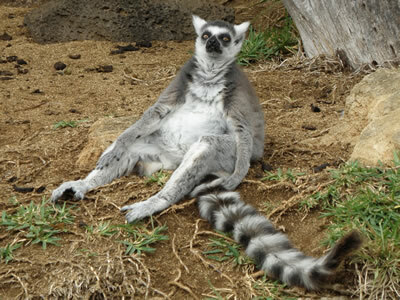 We've got a couple of ideas for a funny caption to go with this photo of a Ring-tailed Lemur, but know you can come up with better ones. Number one: "OK. I'm sitting confortably now when do I get fed? Number two: "No, it is real and it's all mine." 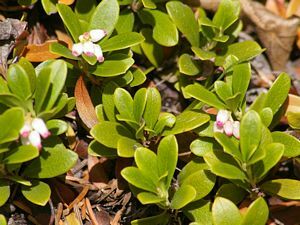 Kinnikinnick, or Common Bearberry, is a low-growing shrub which creates mats on the forest floor. 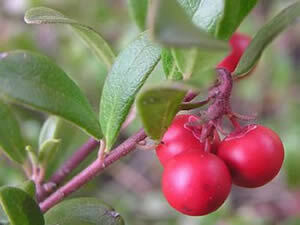 Its scientific name is Arctostaphylos uva-ursi. Arctoctaphylos comes from the Greek arktos which means "bear" and staphyle "bunch of grapes. 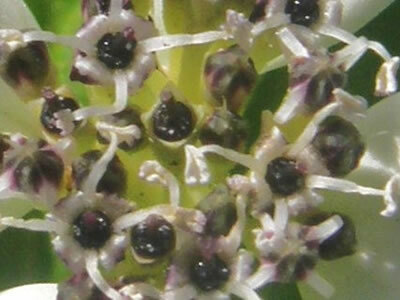 The species name uva-ursi derives from Latin for "bear's grape." Evidently, bears just love these berries! 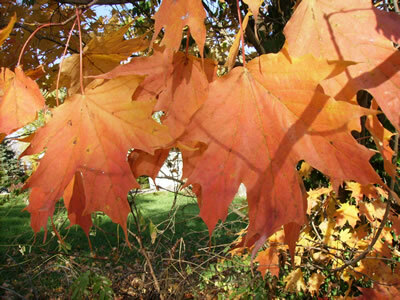 Kinnikinnick comes from the Algonquian language meaning "smoking mixture" a reference to the fact that some people enjoyed smoking the dried leaves. "Of course I do," he replied as he left for work. At 10 a.m. the doorbell rang and his wife opened the door and was handed a dozen long-stemmed red roses. At 1 p.m. a box of her favourite chocolates arrived. The woman couldn't wait for her husband to come home. "First flowers, then chocolates!" she exclaimed. 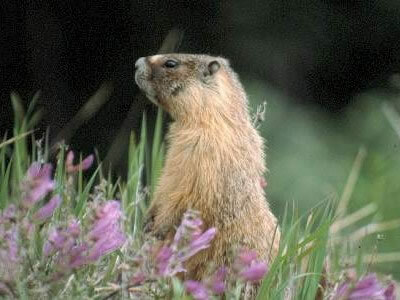 "I've never had a more wonderful Groundhog Day in all my life!" "We didn't ask for all this attention." Do you have a favourite nature photograph from this past year? Going through our files of photos of 2010 we've chosen this one as one of our favourites. 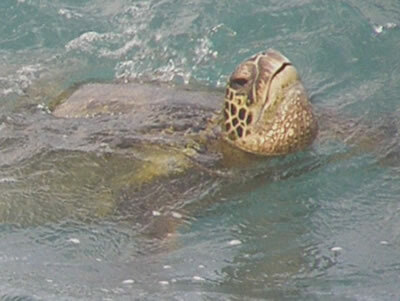 It's not often we come across a Green Turtle so it was a thrill to be lucky enough to spot one on a trip to Hawaii. 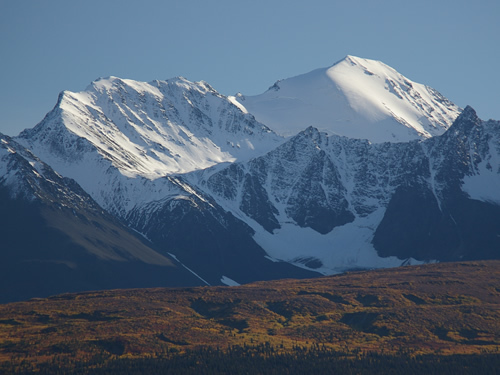 If you'd like to select what you consider to be your favourite nature photo of 2010, we'd love to hear from you and we'll put together a page of selections at the Inn. Please send us your photos and a brief description or explanation of the image and why it's your favourite. 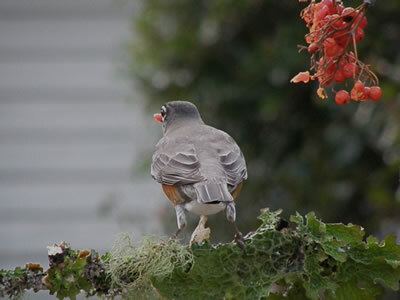 Now's a good time to pull out those berries that we suggested you stash away in the freezer when food was plentiful for our feathered visitors. 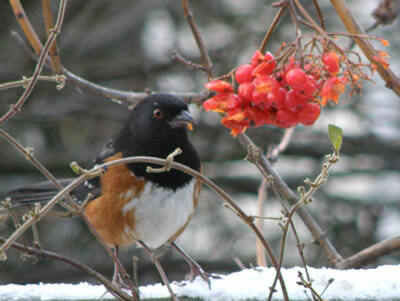 A Spotted Towhee enjoys some Mountain Ash berries that have been strung from a twig. 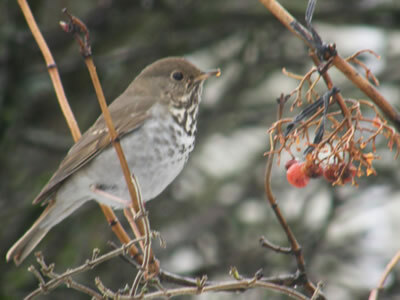 There're not many berries left but a Hermit Thrush is determined to get its share. These berries provided lots of great photo opportunities. 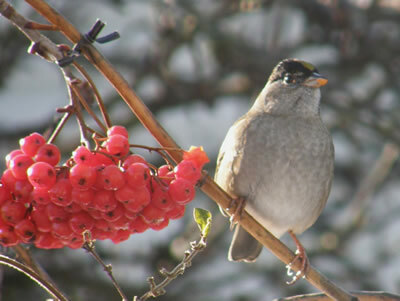 This Golden-crowned Sparrow is enjoying a snack on this chilly day. As we move into 2011 we're already thinking of new ideas and projects. One of them is the concept of a series featuring photographs of great rivers. 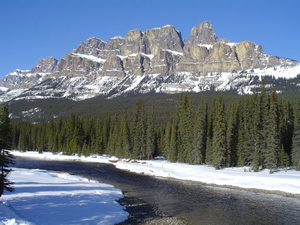 In this picture the Bow River flows below Castle Mountain in Banff National Park. If you have any images that you would like to share with us and our subscribers, please send them to us. We would like to stress that the theme is rivers in nature, and as such, there should be no signs of human involvement or interference like bridges, dams, roads, fences, wires, buildings, etc. Hopefully we can come up with an exciting new feature! 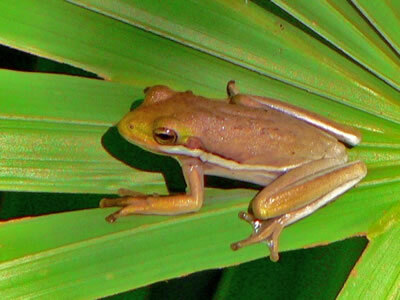 Unwanted background clutter can spoil our photographs but don't give up! You can still get that great picture with a bit of patience and re-positioning. 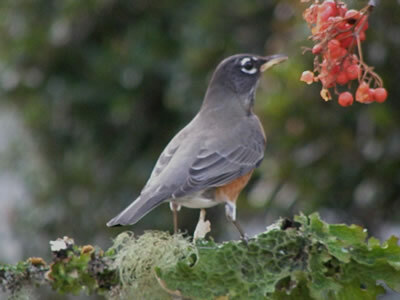 An American Robin has just grabbed a berry is is ready to leave. We know it's going to come back for more. This isn't a great picture because of the background interference. By moving slightly to the left the photographer can avoid the vast white siding of the house in the background. Checking what's behind the subject is very important if you wish to capture a nice clean image. 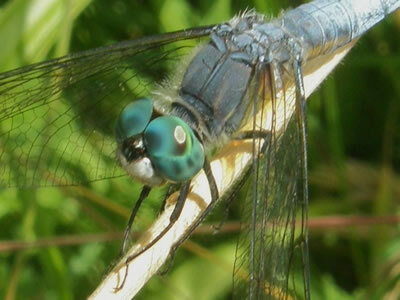 Did you know that when some dragonflies rest they point their wings forward rather than at their sides? This is true of the skimmers which is the largest group of dragonflies and this trait can be helpful in identifying them. truly a giant amongst the giants in the rainforests of the Pacific Northwest. 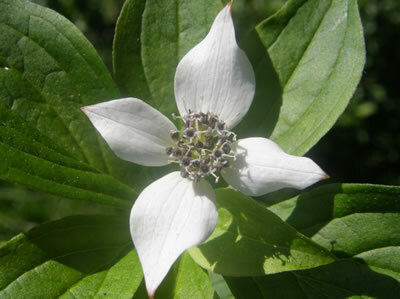 This month's mystery picture is the Dwarf Dogwood. Until next time, best wishes for the Holiday Season from your friends at the Dereila Nature Inn - the Cyber Nature Centre for Nature Lovers. 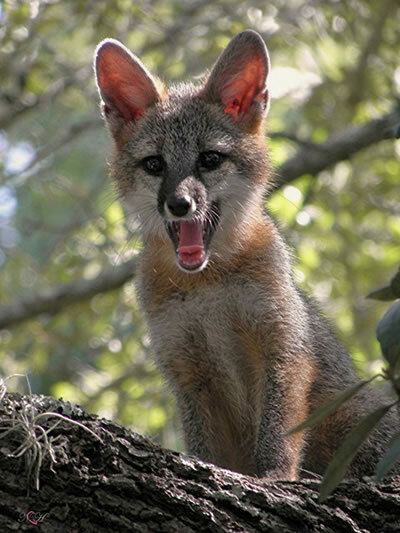 Watch for the next issue of Whispers in your inbox during the first week of January. See you in 2011!